Ecosprinter | To abstain or not to abstain? This question is accompanying me since the first day of my Tour de France. I heard it in Strasbourg, Lyon, Grenoble, Toulouse, Marseille and Rennes, in the back of a bus, in the supermarket as well as on demonstrations, my interviews with politicians and late at night in leftist bars. In the beginning, it was a thought often mentioned in speculations about the second tour, but with every day after the first round, with every demonstration “Ni Macron, Ni Le Pen” all over France more and more people decide to abstain. In the scenario we have, with Macron being the candidate of liberal, economy friendly politics, it is often seen that he is THE incarnation of neo-liberal politics, a former Rothschild banker, coming from the political elite university ENA (École nationale d’administration Strasbourg) and the favorite of the French elite and press. It’s him against Marine le Pen, the candidate of a fascist party, with a protectionist discourse based on sovereignty against the neo-liberal Brussels and the promise to protect the French worker against globalization. With this, many young people on the left decide not to choose. Nobody I talked to considers voting FN, but their opposition against Macron is so fierce that they are not willing to force themselves to vote for Macron to block the Front National. They feel held hostage through the Front Républiquain, being obliged to vote on the second term of every election for politics they don’t want to prevent the Front National from winning the election. It is even questioned if this procedure is still democratic and what elections in France are still worth if you can just chose the “the less evil”. They have had enough of voting “usefully”, without having a better perspective for their future. This anger is expressed at demonstrations I visited like the “Ni Macron, Ni Le Pen” demo in Toulouse or the 1st of May demonstration in Rennes. 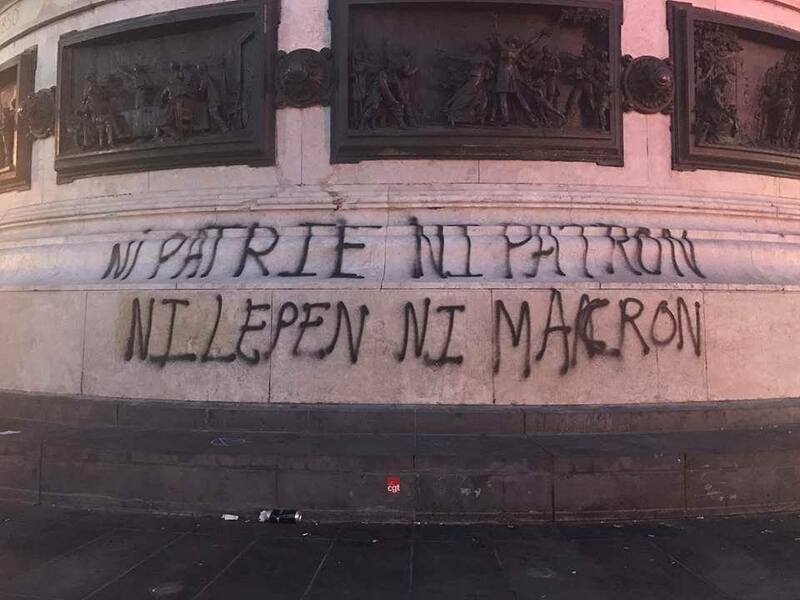 Second one: “The Republican Front will work anyway, Le Pen will never be president” – ironically that’s mostly said by people who have decided that they won’t participate in the Republican Front and who rely on others doing the “dirty work” of casting a ballot for Macron. They count on others to vote against Le Pen, but they could be disappointed. According to a Republican activist I talked to in Rennes, about 80% of Fillon supporters, and nearly everybody he knows, will abstain. It seems that in France, a country where there never was a liberal party that actively defended liberal market principles but they were still practiced by conservative as well as socialist governments, liberalism is as hated or even more than nationalism. The evening of the first round, Jean-Luc Mélenchon, the defeated left candidate, didn’t call upon his electors to vote against the Front National, he invited them to participate in a consultation. This is in accordance to the idea of a citizen movement and that everybody is free to vote whatever they want. Nevertheless, this is a sign that antifascism is not self evident in the French left anymore. The consultation results are now published, and it is devastating: 65 % of La France Insoumise will abstain; only 35% will vote Macron. Jean-Luc Mélenchon and his supporters are harshly criticized for this attitude, on the international level from left and other politicians like Gregor Gysi and Yanis Varoufakis, but also in their families and friends. That is on the one hand good, as it might help to convince some to vote, on the other hand they feel blamed and cornered and might even more refuse to do what they are expected to do. I was told: “It’s not our fault that Le Pen is that strong, it’s liberal politics that strengthened fascism in France”. Yes, on the long term it was not your fault, but in this very election, this Sunday, it’s your responsibility to decide. You have the privilege to vote. I would love to be able to vote in this election, but as a German I don’t have the right to. I will be strongly affected by this election, as it will decide over the future of Europe and the French-German relationship. And it’s not only me, but all Europeans can’t decide, as well as all the foreigners, LGBTQ, many Muslims, refugees, stateless, all the ones who will suffer the most under Le Pen and the legitimization of aggressive actions against these groups, don’t have the possibility to vote. Only you can decide for them. Only you can vote. “The policies of Macron will only strengthen Le Pen, if we vote Macron now we will have Le Pen in 2022” was also often pronounced. This assumes that the rise of nationalism is a natural consequence of liberal politics and that it’s a process that can’t be stopped. I don’t agree. In other countries, like Spain and Greece, the miserable situation has not led to a far right takeover, but to the birth of progressive movements like Podemos, Ciudadanos and Syriza. The chance for the Front National to take over is now, not in five years. The party is well organized, without inner fights, and ready to leap. The electorate and supporter base is very stable; they will go to the polls in high numbers, without abstentions. Nicolas Dupont-Aignan, with an electorate of 5% in the first round, and other politicians, call to vote for Le Pen. The ground was prepared for 30 years now, Marine Le Pen and her father, Jean-Marie Le Pen, succeeded in shifting the discourse so far to the right that their positions seem normal, logic and the only real answer. They attract workers by merging a nationalist party that is blaming foreigners for the bad situation in the country, with some socialist policies like protecting the worker and fighting big capital. They have been legitimized by other politicians picking up their words or doing their policies. When I visited a rally of Sarkozy in the primary half a year ago, I was shocked. He was suggesting to force workless into the army against their will, to take bad behaving children from foreigners into boarding schools against their will and that the French culture is superior to the Arab Culture. Even German far right parties like AFD or NPD wouldn’t dare to say that. Not only the situation in France, with nearly destroyed traditional parties and a left refusing to stand up against the extreme right and rather attacking the center, is perfect for the Front National, also world politics are in favor. The economic crisis in 2007, like the one in 1929, created a strong momentum for autocratic leaders. Trump, Putin, Erdogan, Orban and so on. Brexit has shown that leaving the European Union is possible. The fear or terrorism leads people to call for a strong leader. Normally autocratic leaders need to wait for or to create an event that allows them to declare the state of emergency. France is already in state of emergency since 2015, civil rights are restricted. Soldiers patrol all cities and demonstrations are shut down quickly, repression against left activists is already high. Police officers support the Front National in high numbers. The French President is one of the most powerful heads of state in the world; many call it a “Presidential Monarchy”. The President has the control over the nuclear weapons, the army, he has the right to dissolve parliament and many powers more. Marine Le Pen has everything she needs to transform France into an autocratic state. I know, the French counterforce is strong, she would need to win also the legislative elections and the French left is ready to fight on the street and to block the country with strikes. But what is going to happen after the next terrorist attack? When everybody protesting against the state will be considered as traitors to their fatherland? When people get shot, accidently or not? If Le Pen is once elected, will there still be elections in five years to vote against her? Look at other countries, Russia, Hungary, Turkey, and look back to the history. What did we learn? If I’m not mistaken and Le Pen is not going to be elected, all the better! But if she is elected thanks to the abstention of people who are against her, it’s the responsibility of the French Left, of Greens and young people, that France will have a nationalist head of state, an enemy of the European Union. What’s the alternative? A liberal. Macron. You will need to fight against him for social rights. But you can be sure that this will be a democratic fight, that you can form a parliamentary opposition, that you can protest on the streets and influence him, as he will need the support from many people to be able to work. You can be sure that you will be able to form a strong opposition, perhaps a new, Green- Left party, that unites la France Insoumise, the Greens, and the left wing of the Socialists. And you will be able to transform Europe for the better. With a possible election of former European Parliament President Martin Schulz in Germany and Macron in France, we would have new leaders in Europe, willing to make the European Union more democratic. We can concentrate on making Europe more sustainable, more democratic and fair, instead of spending all our power on fighting the far right and struggling to not let the situation become far worse. Instead of preserving the Europe we have and fighting the nationalist Europe we don’t want, we can shape the Europe we want. You have the choice! Please, go out and vote! Tagged France, French Presidential Elections 2017, Liberal, Macron, Marine Le Pen, Parti Socialiste, President, Republicans, Social Democrats. Bookmark the permalink.